It’s hard to pass up a good Groupon sometimes, especially when it focuses on a flagship Android device. 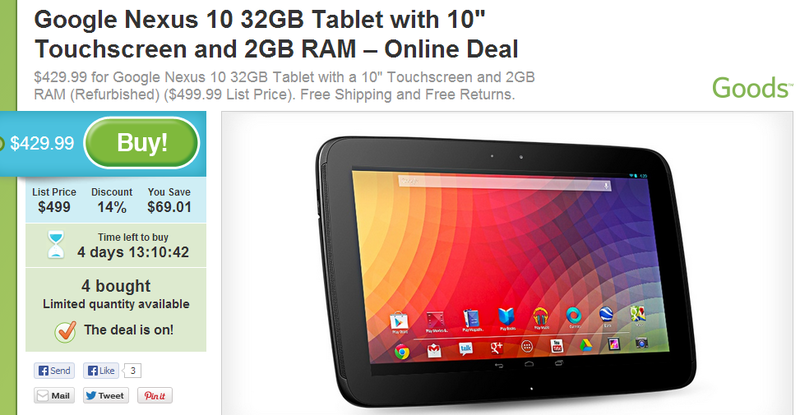 Today, they’re offering up a refurbished Nexus 10 32GB for the price of $429.99, down from its list price of $499.99. That’s a total of $70 in discounts, plus on orders of $15 or more (or something like that), shipping is free. Kind of a win/win if buying a refurb’d device doesn’t bother you. The Nexus 10 is still a heavyweight in its respective category. With an extremely high resolution of 2560 x 1600, a dual-core Exynos processor, and 2GB of RAM, the Nexus 10 is still one beast of a tablet.